Memorial Stone - You Left Us Beautiful Memories..
Home > Memorials > Memorial Stones > Memorial Stone - You Left Us Beautiful Memories.. 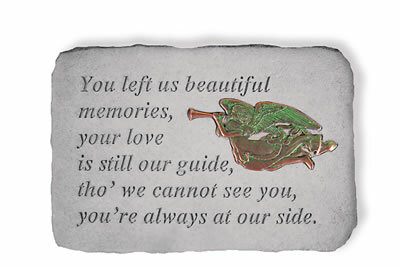 Forever treasure the memory of your loved one with this beautiful memorial. Designed as a memorial for placement in the garden or under a tree, the memorial rock carries a special message and is guaranteed to last a lifetime. The stone features a unique texture that makes it feel as if the stone was chiseled by hand. Made in the USA of cast stone, this garden accent has the look, feel and weight of true stone. "You left us beautiful memories, your love is still our guide, tho' we cannot see you, you're always at our side." Dimensions (approx): 15.5" x 10.5"
Personalized Memorial Stone - Wherever A Beautiful Soul..
Photo Memorial Stone Lift Up Your Heart..